Karibu Tanzania, pack your baggage and join this exciting 8 -day safari holiday in Tanzania! During this safari, you will go on extensive game drives in Tarangire National Park, Serengeti National Park, Ngorongoro Crater and Lake Eyasi; you will have the opportunity to spot wildlife in their natural habitat and explore the magnificent Tanzanian national parks while exploring the daily life and culture for Hadzabe and Datoga tribes , also you will taste and sense spirits of highest mountain in Africa through a day hike in beautiful Kilimanjaro montane forest. Today after breakfast we will drive from Moshi to Marangu gate(1980m) in Kilimanjaro national park and hike to Mandara hut ( 2227m) about 16km round trip. You will explore and enjoy Kilimanjaro rain forest and see a lot of Kilimanjaro fauna and flora, After picnic lunch at Mandara hut you will hike for 30 minutes round trip to Maundi crater for Kibo peak , Mawenzi peak, Kenyan side and lake Chala view. Later you will descend to Marangu gate sign out and we will drive you back to your hotel in Moshi for dinner and overnight. 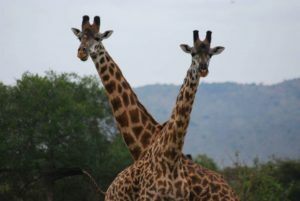 Today after breakfast we drive for 4 hours to Serengeti national park, you will break for picnic lunch at Naabi gate. Enter to the park for game drive until sunset then drive to your lodge/campsite at center of Serengeti for dinner and overnight. Today you have fully day in most beautiful park in the world after breakfast we will start our game drive and late afternoon we will stop for picnic lunch continue with game drive until sunset and drive back to your lodge/ campsite for diner and overnight. After breakfast we will drive to the village situated on the slopes of Mount Kilimanjaro produce your own cup of coffee from tree to cup. This lush rain forest region is known for producing some of the best coffee in East Africa. You will visit coffee farm and learn about how coffee is grown, harvested and processed locally. Try your own hand at processing, roasting and preparing a fresh cup of coffee in Local Chagga way. once you have finished with enjoying coffee cup you will depart crossing villages about 45 minutes to Materuni water falls (80meters higher), along the way you will talk with local people and your guide will show you some local herbs and teaching you the customs and traditions of Chagga tribes whose dominate the Kilimanjaro regions. At the water falls you will be able to swimming and enjoy the green scenery and massive flowing water fresh from Kilimanjaro. After you will back to your vehicles ready to drive to Moshi in your hotel for dinner and overnight.